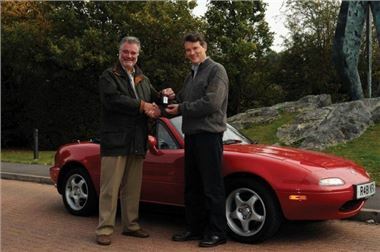 The winner of the red Mk1 MX-5 raffled by the MX-5 Owners Club in aid of Help for Heroes to commemorate the 15th anniversary of the Club and the 20th anniversary of the car has been presented with his prize. Club member Clive Marshall handed over the keys to a delighted father of two, Richard Head from Wokingham. The raffle raised in excess of £13,000 for the charity. The draw for the car was made by Rachel Huxford from Help for Heroes at the MX-5 Owners Club National Rally, which was held at Mallory Park in September.